Found one file extension association related to Adobe Story and 1 file format developed specifically for use with Adobe Story. 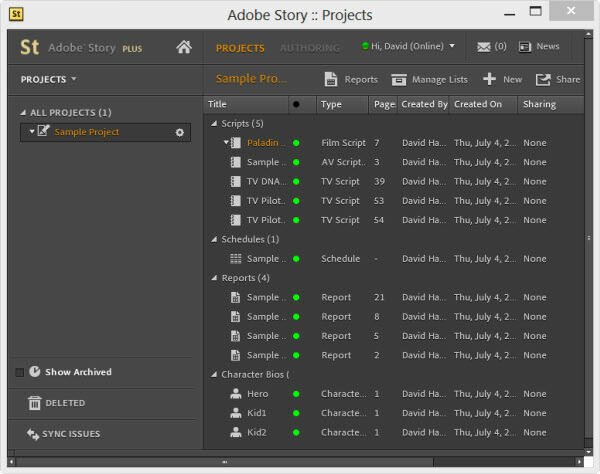 Adobe Story Free provides all the tools needed for writing a screenplay. Easy-to-use features help users to stay focused on telling their story, and more key details can be added to the script to prepare it for production. If you need to share projects, subscribe to Adobe Story CC Plus — it combines all the screenwriting features in Story Free with powerful scheduling and reporting tools plus built-in collaborative features. Story CC Plus is part of an Adobe Creative Cloud complete membership. If you need more information please contact the developers of Adobe Story (Adobe Systems Incorporated), or check out their product website.